Daniel Gabriel Fahrenheit FRS (/ˈfærənhaɪt/; German: [ˈfaːʁənhaɪt]; 24 May 1686 – 16 September 1736) was a Dutch-German-Polish physicist, inventor, and scientific instrument maker. Fahrenheit was born in Danzig/Gdańsk, a predominantly German-speaking Hanseatic city in the Pomeranian Voivodeship of the Polish–Lithuanian Commonwealth, but lived most of his life in the Dutch Republic (1701–1736) and was one of the notable figures in the Golden Age of Dutch science and technology. Fahrenheit was born in the city of Danzig (Gdańsk), Pomeranian Voivodeship in the Polish–Lithuanian Commonwealth, but lived most of his life in the Dutch Republic. The Fahrenheits were a German Hanse merchant family who had lived in several Hanseatic cities. Fahrenheit's great-grandfather had lived in Rostock, and research suggests that the Fahrenheit family originated in Hildesheim. Daniel's grandfather moved from Kneiphof in Königsberg (present-day Kaliningrad) to Danzig and settled there as a merchant in 1650. His son, Daniel Fahrenheit (the father of Daniel Gabriel), married Concordia Schumann, daughter of a well-known Danzig business family. Daniel was the eldest of the five Fahrenheit children (two sons, three daughters) who survived childhood. His sister, Virginia Elisabeth Fahrenheit, married Benjamin Krüger and was the mother of Benjamin Ephraim Krüger, a clergyman and playwright. Daniel Gabriel began training as a merchant in Amsterdam after his parents died on 14 August 1701 from eating poisonous mushrooms. However, Fahrenheit's interest in natural science led him to begin studies and experimentation in that field. From 1717, he traveled to Berlin, Halle, Leipzig, Dresden, Copenhagen, and also to his hometown, where his brother still lived. During that time, Fahrenheit met or was in contact with Ole Rømer, Christian Wolff, and Gottfried Leibniz. 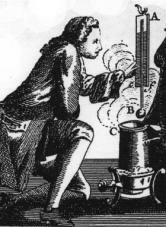 In 1717, Fahrenheit settled in The Hague as a glassblower, making barometers, altimeters, and thermometers. From 1718 onwards, he lectured in chemistry in Amsterdam. He visited England in 1724 and was the same year elected a Fellow of the Royal Society. Fahrenheit died in The Hague and was buried there at the Kloosterkerk (Cloister Church). Thermometer with Fahrenheit (symbol °F) and Celsius (symbol °C) units. The application of mercury (1714) and Fahrenheit scale (1724) for liquid-in-glass thermometers ushered in a new era of accuracy and precision in thermometry. According to Fahrenheit's 1724 article, he determined his scale by reference to three fixed points of temperature. The lowest temperature was achieved by preparing a frigorific mixture of ice, water, and a salt ("ammonium chloride or even sea salt"), and waiting for the eutectic system to reach equilibrium temperature. The thermometer then was placed into the mixture and the liquid in the thermometer allowed to descend to its lowest point. The thermometer's reading there was taken as 0 °F. The second reference point was selected as the reading of the thermometer when it was placed in still water when ice was just forming on the surface. This was assigned as 32 °F. The third calibration point, taken as 96 °F, was selected as the thermometer's reading when the instrument was placed under the arm or in the mouth. Fahrenheit came up with the idea that Mercury boils around 300 degrees on this temperature scale. Work by others showed that water boils about 180 degrees above its freezing point. The Fahrenheit scale later was redefined to make the freezing-to-boiling interval exactly 180 degrees, a convenient value as 180 is a highly composite number, meaning that it is evenly divisible into many fractions. It is because of the scale's redefinition that normal body temperature today is taken as 98.6 degrees, whereas it was 96 degrees on Fahrenheit's original scale. The Fahrenheit scale was the primary temperature standard for climatic, industrial and medical purposes in English-speaking countries until the 1970s, nowadays replaced by the Celsius scale long used in the rest of the world. ^ Chisholm, Hugh, ed. (1911). "Fahrenheit, Gabriel Daniel" . Encyclopædia Britannica. 10 (11th ed.). Cambridge University Press. ^ Encyclopædia Britannica: "Science & Technology: Daniel Gabriel Fahrenheit"
^ Knake, Maria (April 2011). "The Anatomy of a Liquid-in-Glass Thermometer". AASHTO re:source, formerly AMRL (aashtoresource.org). Retrieved 4 August 2018. For decades mercury thermometers were a mainstay in many testing laboratories. If used properly and calibrated correctly, certain types of mercury thermometers can be incredibly accurate. Mercury thermometers can be used in temperatures ranging from about -38 to 350°C. The use of a mercury-thallium mixture can extend the low-temperature usability of mercury thermometers to -56°C. (...) Nevertheless, few liquids have been found to mimic the thermometric properties of mercury in repeatability and accuracy of temperature measurement. Toxic though it may be, when it comes to LiG [Liquid-in-Glass] thermometers, mercury is still hard to beat. ^ Kant, Horst (1984). G. D. Fahrenheit / R. -A. F. de Réaumur / A. Celsius. B. G. Teubner. Retrieved 14 June 2008. ^ See the Fahrenheit and Krueger genealogies. ^ "The Kloosterkerk". The Kloosterkerk. Retrieved 16 September 2017. ^ a b "Fahrenheit temperature scale". Sizes, Inc. 10 December 2006. Retrieved 9 May 2008. ^ Fahrenheit describes, in Latin, these numerical choices in the following paper: Fahrenheit, D. G. (1724). "Experimenta et Observationes de Congelatione aquae in vacuo factae". Philosophical Transactions of the Royal Society. 33 (381–391): 78–84. doi:10.1098/rstl.1724.0016. ^ Heath, Jonathan. "Why does the Fahrenheit scale use 32 degrees as a freezing point?". PhysLink. Retrieved 9 May 2008. ^ Burdge, Julia (10 January 2014). Chemistry: Atoms First. McGraw-Hill. p. 11. ISBN 9780077646479. Retrieved 16 September 2017. ^ MacKowiak, Philip A. (1992). "A Critical Appraisal of 98.6°F, the Upper Limit of the Normal Body Temperature, and Other Legacies of Carl Reinhold August Wunderlich". JAMA: The Journal of the American Medical Association. 268 (12): 1578–80. doi:10.1001/jama.1992.03490120092034. PMID 1302471. ^ Elert, Glenn; Forsberg, C; Wahren, LK (2002). "Temperature of a Healthy Human (Body Temperature)". Scandinavian Journal of Caring Sciences. 16 (2): 122–8. doi:10.1046/j.1471-6712.2002.00069.x. PMID 12000664. Retrieved 4 December 2008. ^ Zimmermann, Kim Ann (24 September 2013). "Fahrenheit: Facts, History & Conversion Formulas". Retrieved 16 September 2017. Bolton, Henry Carrington (1900). Evolution of the Thermometer, 1592–1743. Easton, Pennsylvania: The Chemical Publishing Company. pp. 66–79. Fahrenheit, D. G. (1724). "Experimenta circa gradum caloris liquorum nonnullorum ebullientium instituta (Experiments done on the degree of heat of a few boiling liquids)". Philosophical Transactions of the Royal Society. 33 (381): 1–3. doi:10.1098/rstl.1724.0002. Van Der Star, P., ed. (1984). Fahrenheit's Letters to Leibniz and Boerhaave. Editions Rodopi. Wikimedia Commons has media related to Daniel Gabriel Fahrenheit. Senese, Fred (2005). "Why isn't 0°F the lowest possible temperature for a salt/ice/water mixture?". "Fahrenheit, Gabriel Daniel" . Encyclopædia Britannica (11th ed.). 1911. This page was last edited on 13 March 2019, at 21:31 (UTC).